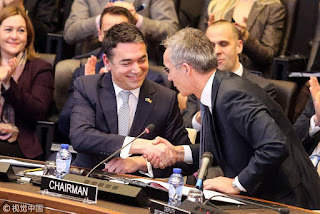 Macedonia takes a major step on road to NATO membership. The signing of accession papers allows Macedonia take part in NATO ministerial meetings as an invitee. Russia has raised concerns against Macedonia becoming part of NATO. Russia has accused NATO of destabilising the Balkans by pushing Macedonia and Montenegro to join NATO. NATO's membership provides a guarantee of mutual defence, provides a welcome insurance policy against possible incursions. North Atlantic Treaty Organisation (NATO) is a military and political alliance established through the Washington Treaty. NATO aims to promote democratic values and enables members to consult and cooperate on defence and security-related issues to solve problems, build trust and, in the long run, prevent conflict. Article 5 of the Washington Treaty states that an armed attack against one of the member states would be considered as an attack against all members, and other members would assist the attacked member, with armed forces if necessary. Q. Which country has signed accession papers that allows it to take part in NATO ministerial meetings as an invitee?